Aspirin, or acetylsalicylic acid, is a nonsteroidal anti-inflammatory drug (NSAID) that is used in horses to relieve pain, reduce fever, treat blood clotting problems, and as an anti-inflammatory agent. NSAIDs work by inhibiting the body's production of prostaglandins and other chemicals that stimulate the body's inflammatory response. Aspirin slows or prevents formation of blood clots by preventing platelets from aggregating and sticking to the inside of blood vessels. Aspirin is used in treating laminitis, chronic lymphangitis, inflamed or infected veins or thrombophlebitis, intestinal ischemia, and other diseases where blood clot formation contributes to the problem. It is also used in treating minor lameness, but because of the short duration of pain relief, may not work as well as other NSAIDs. Aspirin is also used as an anti-inflammatory for some eye problems in horses. Aspirin tablets are measured in grains, rather than in milligrams or grams. One grain equals 64.8 mg.
1Extended use may cause gastric ulcers. Gastrointestinal irritation and bleeding are the most common side effects. Frequent usage at higher doses may cause kidney damage, bleeding disorders, and protein loss. Occasionally, a horse that is allergic to aspirin will have difficulty breathing. Aspirin should be avoided or closely monitored in horses with bleeding disorders, liver disease, kidney disease, or gastrointestinal problems. Because of its effect on clotting functions, it should not be administered within two weeks of surgery. Aspirin is generally not recommended for treating pregnant animals, especially in late pregnancy. Foals require careful monitoring when aspirin is used. 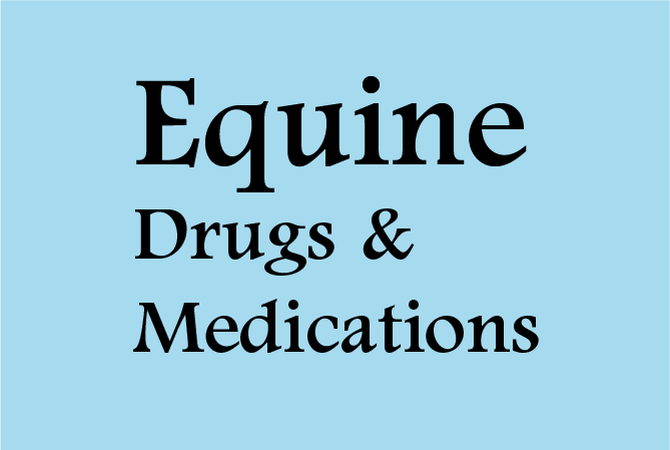 Drugs to protect the GI tract, such as omeprazole, cimetidine, or sucralfate, are frequently used with NSAIDs in premature foals, septicemic foals, foals with questionable kidney or liver function, and foals with diarrhea. With ponies and older horses, use of aspirin should be closely monitored and with the lowest effective dose. Aspirin predates the FDA approval process, but should be used only under a licensed veterinarian's supervision. Aspirin is regulated or prohibited in most sanctioned competitions. It is important to check with the appropriate regulatory group. Aspirin should not be combined with anticoagulant drugs, particularly coumarin derivatives, such as warfarin, nor should it be combined with other anti-inflammatory drugs that tend to cause GI ulcers, such as corticosteroids and other NSAIDs. Caution should be taken with furosemide, which slows down the excretion of aspirin via the kidneys. Overdose of aspirin can cause gastrointestinal ulcers, protein loss, and kidney and liver damage. Signs of toxicity include loss of appetite and depression.